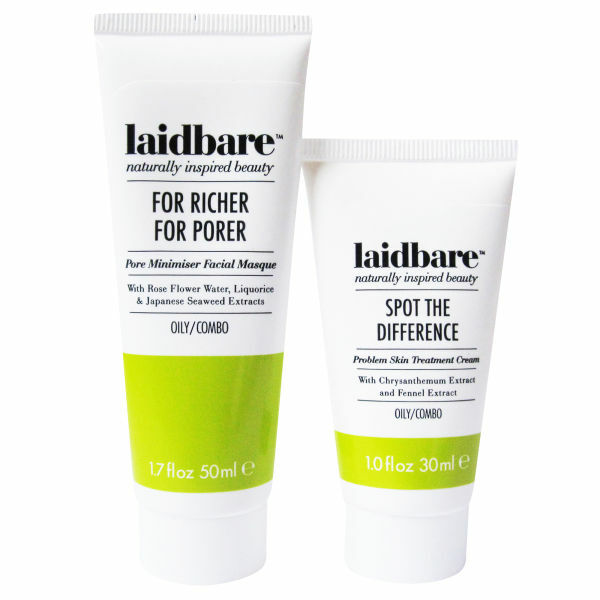 The Laidbare Oily Skin Duo is specially formulated for blemish-prone skin. The nourishing masque helps to draw out toxins and mattify the skin, whilst the treatment cream banishes spots and imperfections for clearer-looking skin. - L.M. For Richer For Porer Pore Minimiser Facial Masque 50ml: This hydrating mask will cleanse and hydrate your skin, whilst reducing the visible appearance of open pores. Kaolin clay draws out impurities, whilst Japanese seaweed extract smoothes and detoxifies your skin. Liquorice and rose water work together to soothe irritation and minimise inflammation, whilst shea butter has hydrating and conditioning properties to keep your complexion soft and supple. 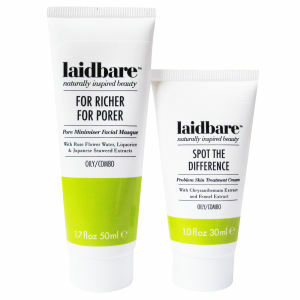 Spot the Difference Treatment Cream 30ml: Enriched with antioxidant and anti-inflammatory caffeine, soothing horse chestnut oil, white fennel and chrysanthemum, this blemish-busting cream helps to reduce the appearance of spots and other skin imperfections.